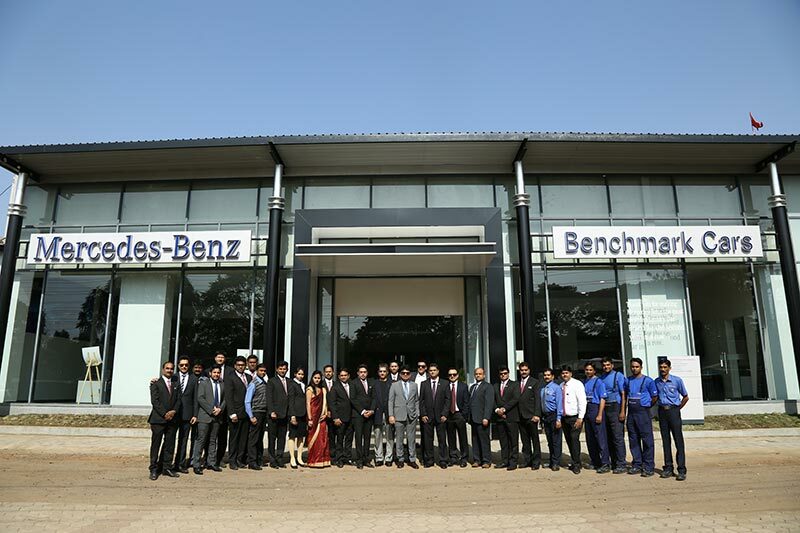 Pursuing its’ ‘15 in 15’ network expansion strategy, India’s largest luxury car manufacturer Mercedes-Benz inaugurated the 14th outlet with the inauguration of a world-class workshop in Bhopal located at Benchmark Cars Estate, M.P.E.B office, 1/2, Govindpura Industrial Area, Govindpura, Bhopal. Benchmark Cars Bhopal is the first 3S (Sales, Service, Spares) dealership in the city of Bhopal. Benchmark Cars Bhopal promises to offer the luxury ownership experience that is synonymous with Mercedes-Benz. We are committed towards enhancing the overall luxury car ownership of our customers and have created benchmark for service parameters in the luxury segment. The inauguration of this world-class workshop is a key step forward towards strengthening our service offerings. We believe service excellence will be a key differentiator in the luxury segment going forward and we at Mercedes-Benz relentlessly strive to give our customers a world-class service experience trying to make them customers for life. I am confident Benchmark Car Bhopal’s new workshop will be instrumental in creating service benchmark in the market. The world-class facility of Benchmark Cars Bhopal promises to be strategic from present and future perspective and, the proximity to posh residential area gives an added advantage. Benchmark Cars Bhopal delivers all state-of-the-art facilities and also provides maintenance and general repairing to the customers. The facility guarantees to be a comprehensive service provider to the discerning customers of Mercedes-Benz in the region. The workshop owing to its large tooling capacity will be taking care of all the servicing requirements of the customers under one roof. The workshop will provide round the clock support in Service, General Repairs, Body Repairs, Paint Job, Wheel Alignment, Wheel Balancing, Tyre Change, Car Wash, Polishing and gamut of other servicing requirements. With a capable strength of 9 people, the workshop assures some first-rate services. Benchmark Cars already has 8 facilites in Western India. It has been Benchmark Cars’ endeavour to offer unparalleled ownership experience to our discerning customers. Mercedes-Benz has seen an augmentation in the city towards luxury cars and that is one of the reasons behind bringing the best of services to our increasing customer base in Bhopal. The cities of Jabalpur and Gwalior will also be instrumental in realigning the luxury car market surrounding Bhopal. We are ready for the future and aim to continue our efforts towards creating the famed Mercedes-Benz brand ownership experience in the market. The company has the densest network penetration for a luxury car segment with 81 outlets across 40 cities. The ‘Live the Best’ strategy of Mercedes-Benz translates into continuous endeavor in creating new avenues of customer fascination and delight. Parts of the strategy are two key pillars – Best Customer Experience (Enhanced Engagement), Best footprint (Highest Penetration), means creating new benchmarks in terms of modern luxury and exquisite experience for the customers at an ideal location in their proximity. One-of-its kind initiatives like Star Xperience are being implemented across dealerships guided by Mercedes-Benz India in enhancing this environment of ‘Live the best’. All the Five Human Senses of Sight, Sound, Touch, Smell and Taste are directly and very uniquely addressed in the dealerships through carefully chosen elements which stimulate these senses. This essentially aims at bringing in the feeling of exclusivity and also impresses the existing and potential customers with an ambience that spells modern luxury. The enchanting elements of impressing the five Senses of a Patron create uniqueness in terms of universal experience across all Mercedes-Benz dealerships.